The Hawaiian Volcano Observatory (HVO) is a volcano observatory located at Uwekahuna Bluff on the rim of Kīlauea Caldera on the Island of Hawaiʻi. The observatory monitored four active Hawaiian volcanoes: Kīlauea, Mauna Loa, Hualālai, and Haleakalā. Because Kīlauea and Mauna Loa are significantly more active than Hualālai and Haleakalā, much of the observatory's research is concentrated on the former two mountains. The observatory has a worldwide reputation as a leader in the study of active volcanism. Due to the relatively non-explosive nature of Hawaiian volcanic eruptions for many years, scientists could study ongoing eruptions in proximity without being in extreme danger. Located at the main site was the public Thomas A. Jaggar Museum. In May 2018 the facility was closed and the property evacuated due to collapse explosions at Halemaʻumaʻu Crater and earthquakes related to the 2018 lower Puna eruption that also led to the closure of the Kīlauea unit of Hawaii Volcanoes National Park. While portions of the park were reopened in September, it is unclear when the Observatory and Museum will be able to reopen as well. Besides the oral history of Ancient Hawaiians, several early explorers left records of observations. Rev. William Ellis kept a journal of his 1823 missionary tour, and Titus Coan documented eruptions through 1881. Scientists often debated the accuracy of these descriptions. When prominent geologist Thomas Jaggar of the Massachusetts Institute of Technology gave a lecture in Honolulu in 1909, he was approached by businessman Lorrin A. Thurston (grandson of Asa Thurston who was on the 1823 missionary tour) about building a full-time scientific observatory at Kīlauea. The Hawaiian Volcano Research Association was formed by local businessmen for its support. George Lycurgus, who owned the Volcano House at the edge of the main caldera, proposed a site adjacent to his hotel and restaurant. In 1911 and 1912, small cabins were built on the floor of the caldera next to the main active vent of the Halemaʻumaʻu Crater, but these were hard to maintain. MIT added $25,000 in support in 1912 from the estate of Edward and Caroline Whitney to build a more permanent facility. The first instruments were housed in a cellar next to the Volcano House called the Whitney Laboratory of Seismology. Inmates from a nearby prison camp had excavated through 5.5 feet (1.7 m) of volcanic ash. Massive reinforced concrete walls supported a small building built on top of the structure. Professor Fusakichi Omori of Japan, now best known for his study of aftershocks, designed the original seismometers. This seismograph vault (building number 29 on a site inventory) is state historic site 10-52-5506, and was added to the National Register of Historic Places on July 24, 1974 as site 74000292. From 1912 until 1919, the observatory was run by Jaggar personally. Many important events were recorded, although as pioneers, the team often ran into major problems. For example, in 1913 an earthquake opened a crack in a wall and water seeped in. The windows meant to admit natural light caused the vault to heat up in the intense tropical sun. The opening of the national park in 1916 (at the urging of Thurston) brought more visitors to bother the scientists, but also park rangers who would take over public lectures. The prison that had supplied laborers was replaced by the Kīlauea Military Camp. In 1919, Jaggar convinced the National Weather Service to take over operations at the observatory. In 1924, the observatory was taken over by the United States Geological Survey and it has been run by the USGS ever since (except for a brief period during the Great Depression, when the observatory was run by the National Park Service). When the Volcano House hotel burned to the ground in 1940, the old building was torn down (although the instruments in the vault continued to be used until 1961). George Lycurgus convinced friends in Washington D.C. (many of whom had stayed in the Volcano House) to build a larger building farther back from the cliff, so he could built a new larger hotel at the former HVO site. By 1942, the "Volcano Observatory and Naturalist Building" was designated number 41 on the park inventory. However, with the advent of World War II, it was commandeered as a military headquarters. HVO was allowed to use building 41 from October 1942 to September 1948, when it became the park headquarters (and still is today, after several additions). About two miles west, in an area known as Uwekahuna, a "National Park Museum and Lecture Hall" had been built in 1927. The name means roughly "the priest wept" in the Hawaiian Language, which indicates it might have been used to make offerings in the past. The HVO moved there in 1948 after some remodeling of the building. This site was even closer to the main vent of Kīlauea. In 1985 a larger building was built for the observatory adjacent to the old lecture hall, which was turned back into a museum and public viewing site. In the mid-1980s, HVO launched the Big Island Map Project (BIMP) to update the geologic map of the island of Hawai'i. Its major publication is the 1996 Geologic Map of the Island of Hawai'i (1996) by E.W. Wolfe and Jean Morris, digitized in 2005. Modern electronic equipment now monitors earthquakes from several sites. This information is provided immediately over the Internet, as is live coverage of ongoing eruptions from several webcams accessible from the Hawaiian Volcano Observatory website (see External links). Another important function of HVO is to monitor the sulphur emissions that produce the volcanic pollution condition known as vog. The observatory advises the park service when to close areas due to this and other volcanic hazards. While the main Observatory building itself was not open to the public, the adjacent Thomas A. Jaggar Museum included interpretive exhibits on the work performed at the observatory. The exhibits ranged from general information on volcanoes and lava to the scientific equipment and clothing used by volcanologists. Some of the museum's windows provided a sheltered view of the Kīlauea Caldera and Halemaʻumaʻu Crater. A public observation deck, overlooking Kīlauea and formerly open 24 hours a day, provided views of the area. It was a popular destination within Hawaii Volcanoes National Park, located at coordinates 19°25′12″N 155°17′16.8″W﻿ / ﻿19.42000°N 155.288000°W﻿ / 19.42000; -155.288000, on Crater Rim Drive west from the Visitor Center. On May 10, 2018, Hawaii Volcanoes National Park was closed to the public in the Kīlauea volcano summit area, including the visitor center and park headquarters, due to explosions, earthquakes and toxic ash clouds from Halemaʻumaʻu Crater. While much of the park was reopened on September 22, the Observatory and Jaggar Museum remain closed. ^ William Ellis (1825). "A journal of a tour around Hawai'i, the largest of the Sandwich Islands". Crocker and Brewster, New York, republished 2004, Mutual Publishing, Honolulu: 282. ISBN 1-56647-605-4. ^ Coan, Titus (1882). Life in Hawaii. New York: Anson Randolph & Company. ISBN 0-8370-6036-2. ^ a b c "Buildings and Facilities". United States Geological Survey. Retrieved 2009-06-24. ^ Russell A. Apple. "HVO History". United States Geological Survey HVO web site. Retrieved 2009-07-11. ^ Russell A. Apple (1972). "Whitney Seismograph Vault #29 nomination form". National Register of Historic Places. National Park Service. ^ "About KMC". Kīlauea Military Camp. Archived from the original on 2009-04-23. Retrieved 2009-06-25. ^ "Thomas Jaggar, HVO's founder". Hawaiian Volcano Observatory's Volcano Watch. March 21, 1997. Retrieved 2009-06-21. ^ "Lookup of "Uwekahuna"". on Hawaiian Place Names web site. Retrieved 2009-06-25. ^ Wolfe (compiler), E. W.; Morris, Jean (1996). "Geologic map of the Island of Hawaii". ^ "Characteristics of Hawaiian volcanoes". Reston, VA. 2014: 442. ^ "Earthquakes in Hawaii". USGS Hawaiian Volcano Observatory Network. Retrieved 2009-06-25. ^ "Closed Areas and Advisories". National Park Service Hawaii Volcanoes National Park web site. ^ "Jaggar Museum". National Park Service web site. Retrieved 2009-06-21. Robert W. Decker; Thomas L. Wright; Peter H. Stauffer, eds. (1987). Volcanism in Hawaii. Volume 1: Physiography, Tectonics, and Submarine Geology. 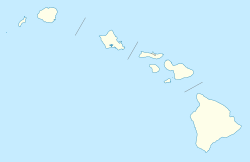 Geology of the Island of Hawaii. Petrogenesis and Volcanic Gases. U. S. Geological Survey Professional Paper 1350 (397 MB PDF). Thomas L. Wright; Peter H. Stauffer; Robert W. Decker, eds. (1987). Volcanism in Hawaii. Volume 2: Structure, Dynamics, History of Investigations of Hawaiian Volcanism. U.S. Geological Survey Professional Paper 1350 (339 MB PDF).